Artwork: Lithographs in color by Barnett Freedman. Edited and amended by Herbert Farjeon. Part of the LEC Shakespeare series. LEC #507 of 1950. LEC exclusive. Front Binding – This post brings my blog its first glimpse into the fabled LEC Shakespeare; a 37 volume opus of book publishing that stands as some of the finest in the canon of the Limited Editions Club. I’ve covered the series loosely before, posting a list of the series and its illustrators some time ago. However, I didn’t expect to stumble upon the a part of the set any time soon; most of my book haunts prior to my move lacked any of the LEC Shakespeare, and I’ve only come across one other book before this one in my travels, and I didn’t have the money to purchase it then. And yet here we are, with a “complete” edition of Henry the Fourth, Part I. 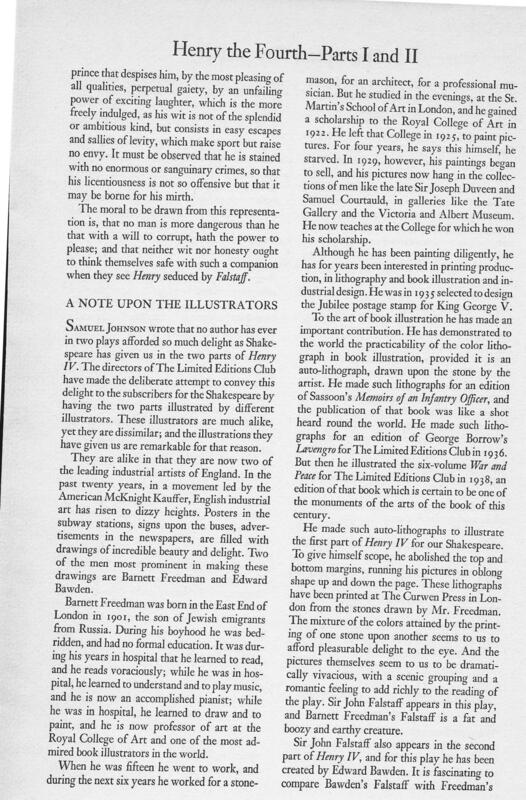 The goal of the LEC Shakespeare was to celebrate the greatest author in the English language with a deluxe printing of all of the Bard’s plays and poems, designed by the masterful Bruce Rogers, printed by the leading experts in publishing, and featuring some of the finest artistic talents in book illustration decorating each volume in its own unique way. George Macy wanted this series to be the 20th century’s definitive publication of Shakespeare, and based on this admittedly limited exposure to the series, the goal was met. 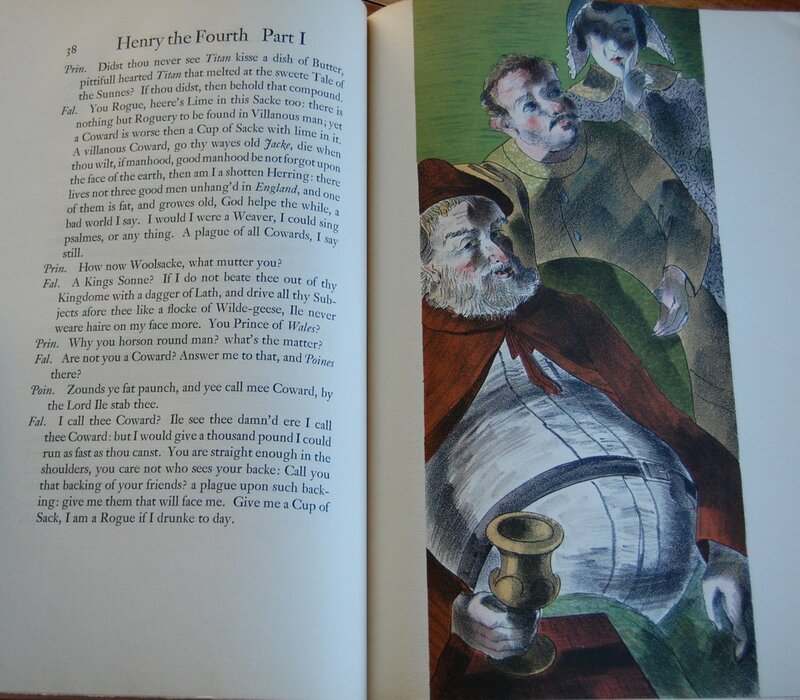 This edition of Henry IV Part I is a culmination of amazing design, artwork, and printing synergy. Rogers’ is perhaps the LEC’s greatest designer, and this set is among his finest. 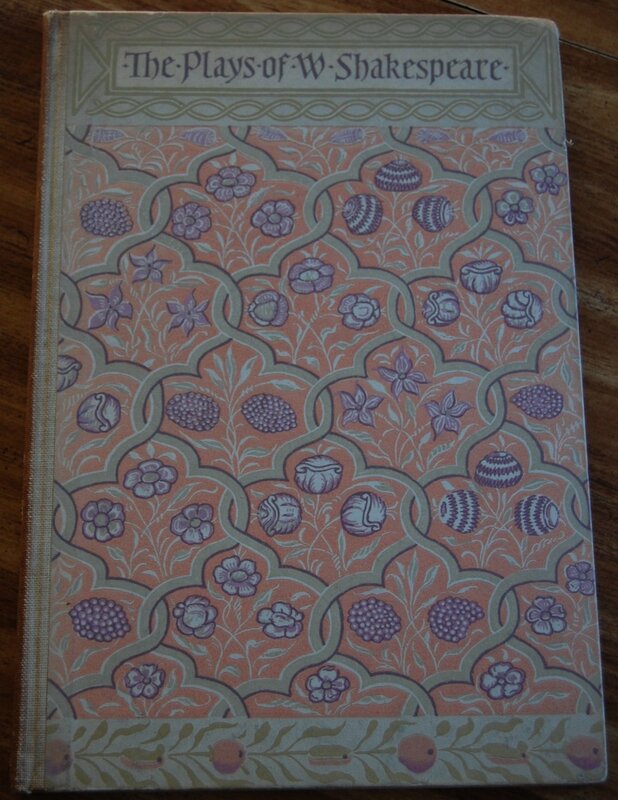 The binding is a lovely recreation of Elizabethan era fabric and motifs. The font choice and layout is ideal for a book of this size. And the execution of these design plans were delightfully executed by printing house and bindery A. Colish. However, the real standout of this book is the stunning reproduction of Barnett Freedman’s lithographs. Freedman hasn’t been my favorite artist in the Club’s canon, as noted in my earlier discussion of his work in Anna Karenina. Here, though? My goodness, the reprinting of his color lithographs is stunning. His auto-lithographs were pulled by the Curwen Press, and Freedman ignored the top and bottom margins, making his oblong prints stylistically stand out not only in craft but in composition. The colors were stone-specific, as is the case with the lithographic process, so once again marvel at the expertise of both artist and printer to make these separate components unite so successfully. The quality of these prints is literally beyond anything else I’ve seen of Freedman’s, and arguably above several other LEC volumes. It’s divine. The colors are crisp, luscious and deep; the artistry of Freedman’s linework nigh-perfect. And that may be the greatest strength of this set — the attention to printing detail is exceptional. Hamlet, illustrated by Eric Gill, 1933. Poems and Sonnets, 2 volumes, designed by Bruce Rogers, 1941 (these are designed to match the 1939-1940 plays). The Life of Henry V. Illustrated by Fritz Kredel, modeled after the Olivier film, 1951. 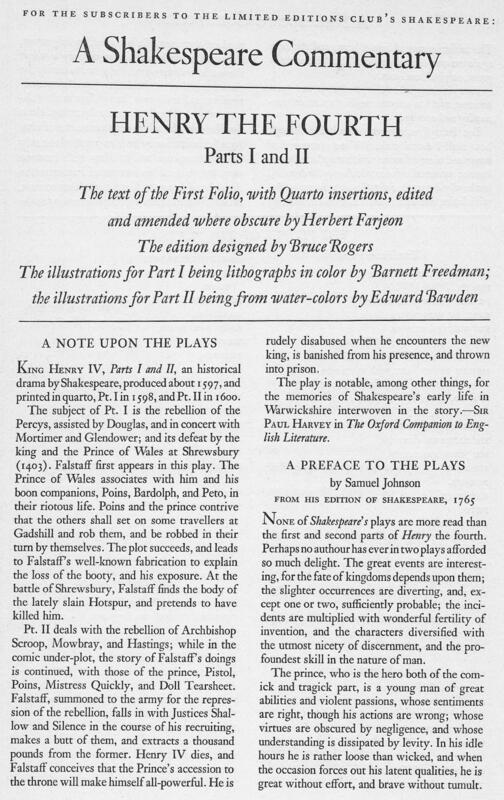 The Heritage Press had five exclusive Shakespeare publications as well. Romeo and Juliet, illustrated by Sylvain Sauvage, 1935. This is one of the “First Six” Heritage Press books, and some copies are a deluxe edition signed by Sauvage. Sonnets, illustrated by Valenti Angelo, 1941. The Complete Histories, Tragedies and Comedies of Shakespeare, illustrated by John Farleigh, Agnes Miller Parker and Edward Ardizzone (respectively), 1958. If you want to know more about this particular set, you can’t go wrong with the extensive report of fellow enthusiast Chris at Books and Vines. Title Page – I don’t really know if my camera can do these illustrations justice. They really are gorgeous, but I don’t think I have the optimal lighting setup to convey this correctly. 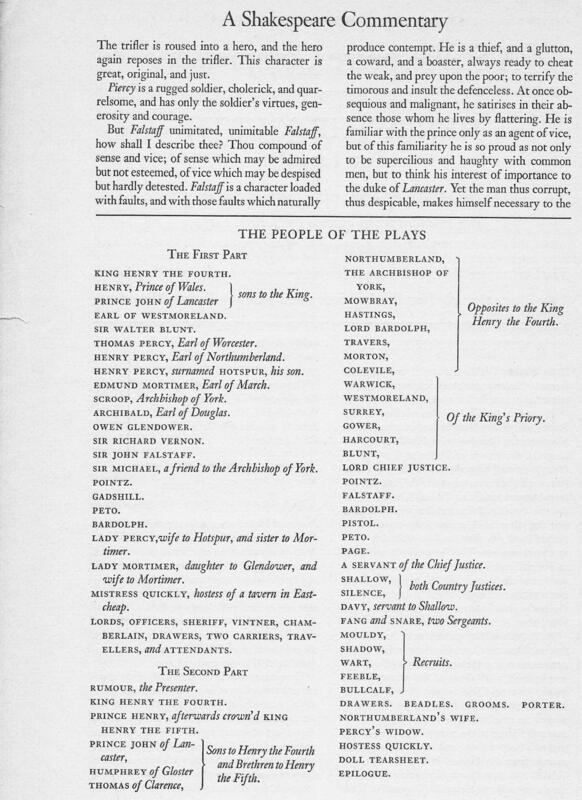 The text is taken from the First Folio and some Quarto insertions, and Herbert Farjeon served as editor. 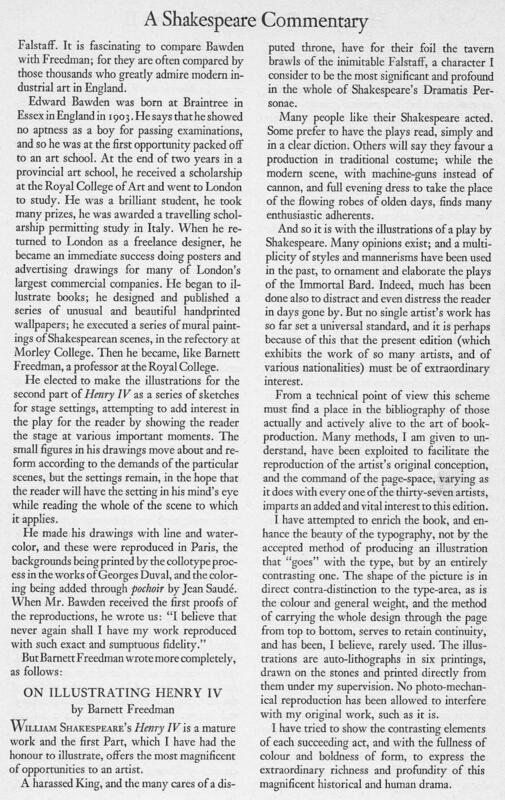 Colophon – For the LEC Shakespeare, Macy upped the limitation count to 1950 from the usual 1500. This volume came from the 507th set. Page 39 – Example of the text as well. Personal Notes – This came from the Bookstore in Chico, CA. Only 38 more to go…but I’m happy to have this one. It is a little worn on the outside, but the inside is exquisite. You are currently viewing the archives for May, 2016 at The George Macy Imagery.